There are four main things you should evaluate when deciding whether or not to replace your tires. Failing to meet any one of these four criteria means your tires should be replaced immediately. Your tires should have at least 1/16th of an inch of tread. If you will be driving on wet or icy roads, the tread should be double that. The easiest way to check your tire tread is to use a penny. Insert the penny into the grooves on your tire with Lincoln’s head facing down. If the top of Lincoln’s head is still visible, you need to replace your tires. Are the Sidewalls in Good Shape? Check the sides of your tires for cracks, bulges, or bubbles. Any of these indicate damaged tires that should be replaced. How Many Miles Have you Put on Your Tires? If you’ve put over 40,000 miles on your tires it is time to have them checked and you should plan on replacing them soon. How Old are Your Tires? 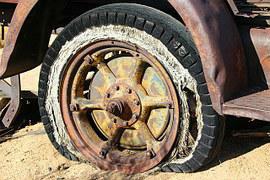 Even if you don’t drive your car very often, your tires can wear out simply because of old age. Tires last a maximum of 10 years, and many manufacturers recommend replacing them after 6. Check your owner’s manual and the specific tire manufacturer guidelines to see when you should replace your tires.